January started out hopeful with the dry weather which successfully kept the course in good condition, with the added colder weather meant that the disease on the greens started to decrease. However towards the end of the month the weather turned to the good old British winter that we all love, with 30mm of rain falling heading into February. We were also greeted with a layer of snow resulting in a four day course closure. Prior to the weather coming in we were able to continue with the re-turfing of the tees finishing all areas we had set out to do. 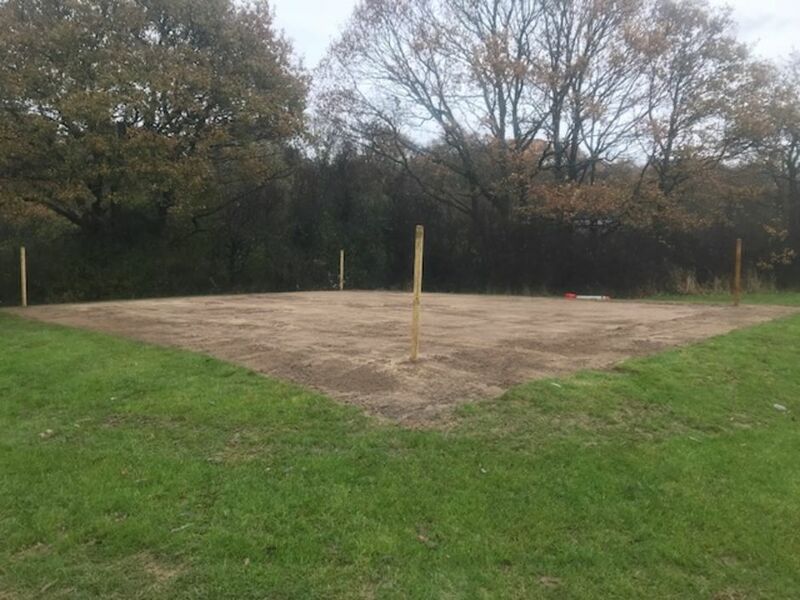 Unfortunately the temporary tees will be in use until the turf has had adequate time to bed in and establish itself, hopefully you understand the importance of this process and am sure you are all looking forward to a flat teeing area in the spring. 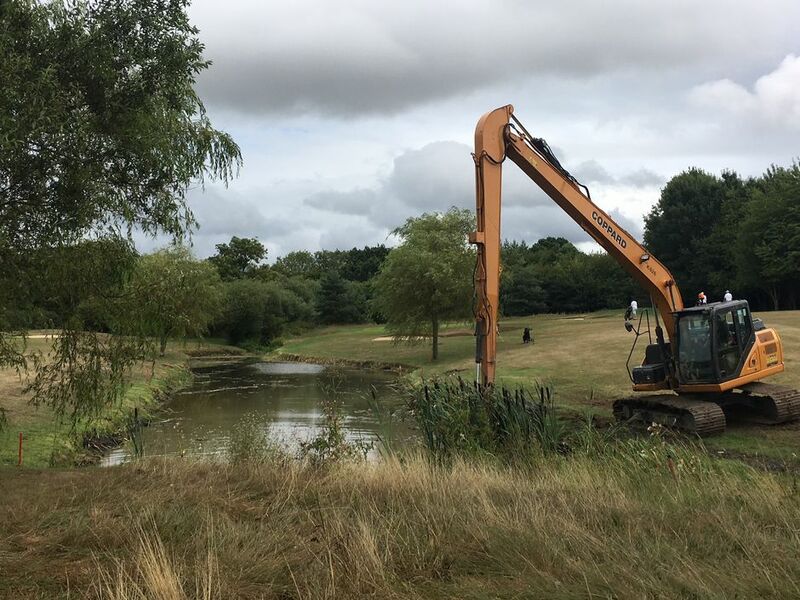 Once the tees were completed we could then focus our energy on repairing some of the drain lines that have become excessively deep not only causing annoyance to yourselves but also affecting our machinery. We are looking to get as many of the worse ones done as possible before grass cutting starts in spring. This objective will continue going forward as there are many that need attention. Towards the end of the month we started filling in potholes in the pathways and topping up the limestone. On some of the paths that had puddle issues we raised the path so that the camber would force the water to run off rather than puddle up. In some cases we added new drains to battle the larger puddle areas such as the path by the 2nd tee and the 11th tee which was completed before Christmas. Another bad area is the 14th carry which we plan to fix by installing a jiffy drain in the low spot which will run into a path drain next to the area of the path that puddles, this will then be fed into a pipe that will run down towards the hedge line into the ditch. This should hopefully solve the bog issue that arises every winter. Due to the colder weather Aeration had to be postponed until next week when the temperatures are set to be more on the warmer, drier side of the scale. Although this will be good to hopefully dry the course out a bit, it also means that the disease risk will also increase. We will be keeping an eye on the movements of the disease and take action as required. As the list of banned chemicals that we use to maintain the course keeps growing year after year, we have decided to move towards the direction of Symbio which is a more biological approach to the use of fertiliser. It promotes the growth of beneficial microbes that help break down the thatch turning it into nitrogen resulting in less use of fertilisers. The use of this product will produce a healthier plant than one treated with chemicals, the healthier plant will therefore have better resistance to disease, resulting in the use of fewer chemicals. Cheers, hope you enjoy the course. December has seen 150mm of rain throughout the month meaning the course became wet for some time. The drier, milder weather towards the end of the month has meant the course has dried out extremely well and returning from our Christmas break, we have managed to cut the entire course. However disease pressure has been extremely high over the Christmas period. This has meant some scarring on a few greens. 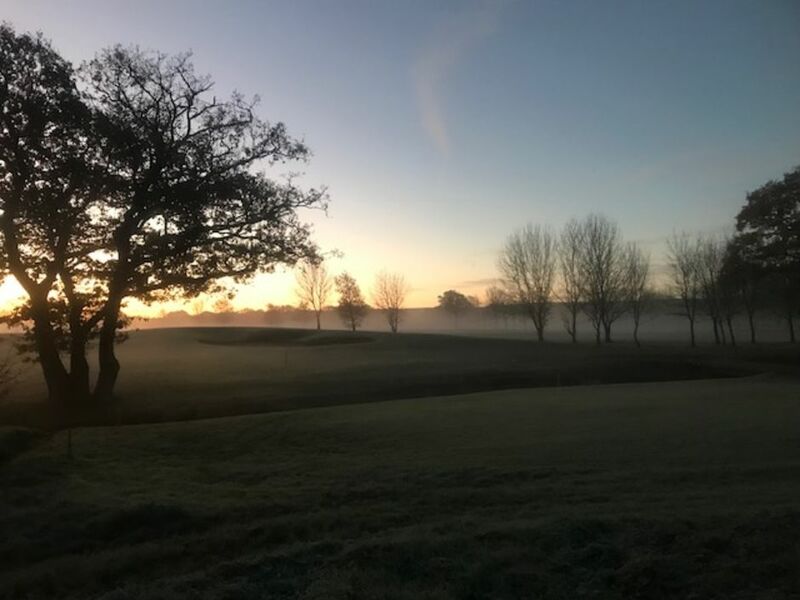 The forecast for January is looking dry and cold so this is encouraging for golfing weather and the course is in fantastic condition going into the new year. We have had a total of 923mm of rain this year, considering we had nothing for the months of June and July this is still a fair amount. The tee turfing is coming along well with 3 tees left to turf. We hope to have these done in the next few weeks with the Greenkeepers working through 1 load of turf per week. We will also complete with the bank on the 5th pond. We are in discussions as to carry out more tee renovations next autumn as there are still some tee boxes that remain uneven. We have installed a drain on the path by the 2nd tees to get rid of the puddle that collected there. There are a couple of other areas we intend to drain including the 14th carry and the 15th tee path. The drain we have installed by the 11th red tee has been a success. Moving on into 2019 and with the changes in the industry, we are going to employ a slightly different approach to managing the greens. With the removal of even more chemicals later this year, it will become even harder to control disease through chemical control. With the use of bio-stimulants and beneficial fungi, we aim to reduce the need for chemicals over a period of time. This should encourage the desirable grasses to thrive in a healthier environment, discouraging the weaker grasses which are more susceptible to disease. The beneficial fungi will also help reduce thatch by turning into food for the plant to use. This is not an instant process so results will not be apparent overnight, however this will be better in the long run both for the greens and the environment. There are a number of projects that have been discussed for this year including more pathways, raising the worst of the drainage ruts, the possibility of a bunker on the 10th and possibly some more work on the 5th hole to add some character. As these plans formulate we will keep you informed. Lastly I would like to thank the team for their efforts this year in what can be described as a challenging but educational 12 months. 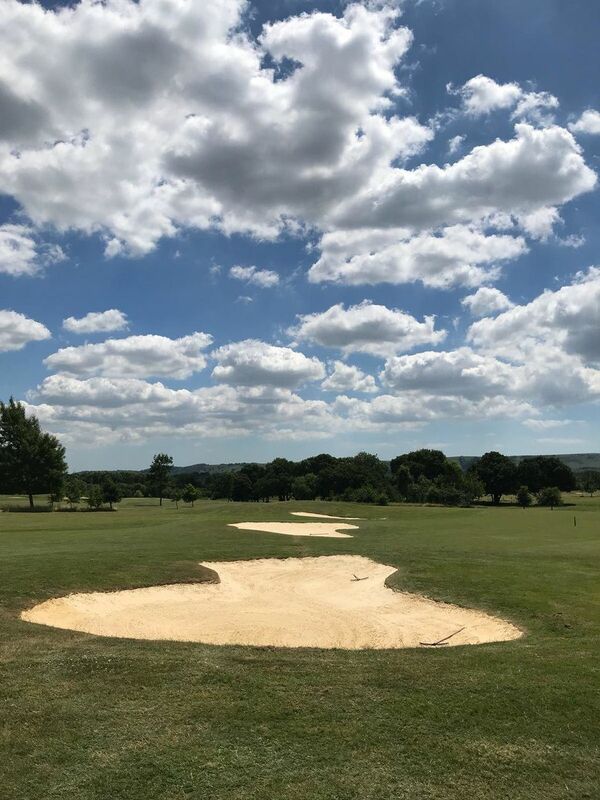 We hope you have had a successful golfing year and made the most out of the course here at Mid Sussex Golf Club. 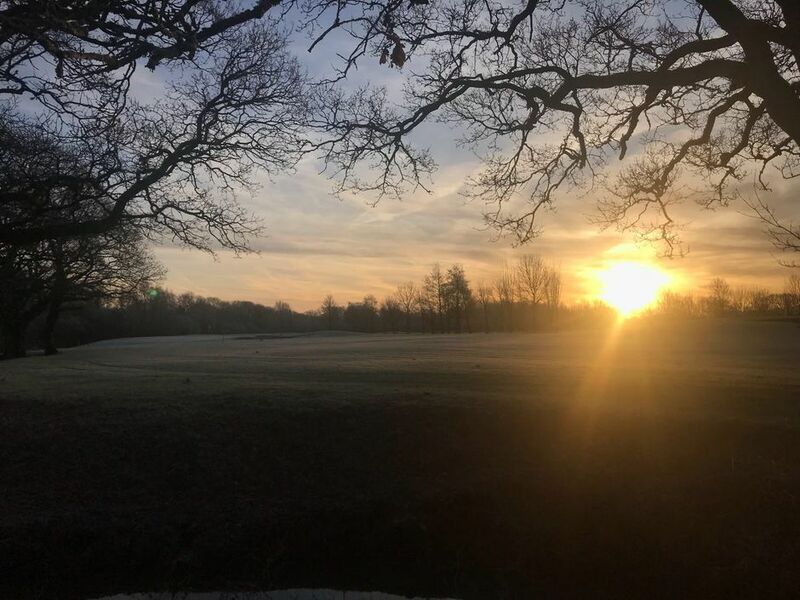 The greens staff look forward to another year of improvements and presenting the course to a high standard for your enjoyment so here’s to a successful 2019! The rain has begun to fall making the course soft under foot and as I write this blog we have had nearly two inches of rain in the last 48 hours. The greens are still in great condition with our winter aeration working well. Slitting and vertidraining every 2 weeks means the water will be moving away from the surface quickly. The mild conditions have meant disease pressure has been reasonably high for a long period of time, with the occasional frost slowing it down. This has meant a few areas on the greens have been affected but overall there has been very little scarring. We will continue to use a preventative fungicide plan into next month and then stop going into the new year as the cold weather sets in. The rain has been a test of the new drains put in around the course which I am pleased to say are all working well. The 11th path is now puddle free and the 9th fairway does not flood from the road. The drain on the 15th path is also catching run-off water. With many courses still feeling the aftermath of this years’ extreme weather, we should consider ourselves in a good position compared to those who have suffered from what has been the driest summer on record. Let’s hope the balance does not tip the other way and stay wet all winter! After some recent soil tests, I can report a pleasing reduction in thatch in the greens. On average, the greens that were tested last year and then tested again this year have all shown a considerable reduction in organic matter dropping from 11% to 8% in the top 40mm of the soil profile. This is due to the Graden work carried out in September, a careful feeding program and light top dressings throughout the year along with moderate irrigation. With the target range being between 4% and 6%, we still have a little way to go however this is very encouraging considering the challenges of this years’ dry spell. Well done to the team for their continuing efforts throughout the year. The tees we have done in-house have all been turfed and will now be left to bed in over winter except for the 13th white. This tee had a tree root infestation from the trees to the rear of the tee which have now been removed. We have stripped the old turf and rootzone, and replaced it with some more suitable material. The contractors have kindly offered to laser level this tee as they have the equipment here. They have begun work on the 5th tees with these being the worst on the course. Already you can see a significant change on the whites, with the playing area being enlarged by 300%. The yellow/red tee will be levelled and prepared for turf. there are also two more sprinklers being installed. The 5th bank has been reshaped and will be seeded to bring back grass coverage. These improvements will give the hole a fresh look. With some of the left over turf from the tees we have been turfing some of the worst drain lines. The 13th apron was quite a severe dip, along with the 11th fairway bunkers and also the 9th apron. The Greenkeepers’ time for the next few weeks at least, will be focused on turfing the tees that the contractors renovate. The traffic management around the course has been put out with posts and rope directing golfers away from wet areas. We do our best to keep the damage to minimum so please use paths where possible, especially if you are using a trolley. We are now looking ahead to next year and thinking of more course improvements. With good progress made this year considering the extreme weather, decisions will be made to see where further improvements can be made around the course. That’s all for this month, see you on the course. 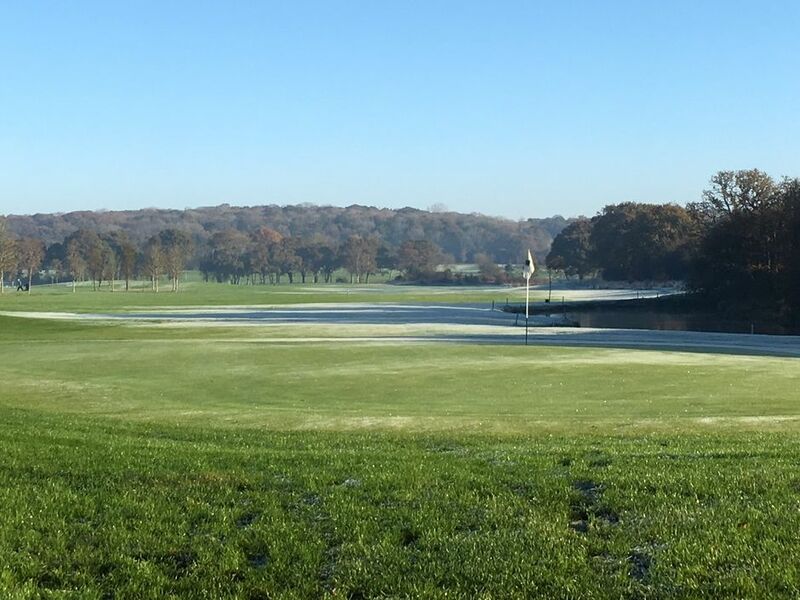 With the season coming to an end we have endeavoured to continue winter-proofing the course as much as possible to allow golf through the wetter months. If you have played recently you will have seen the two extra paths on the 6th and 7th carrys which were particularly wet last year. This should help traffic around the course and minimise the mess. We have also installed a trench drain beside the ladies tee on the 11th to stop the flooding that occurs. There are plans to install a few more path drains around the course over the winter if time allows. The bridges around the course have all now been upgraded with some sheet metal to provide extra strength and some longevity. Hopefully we will not have to revisit these for some time. The greens have recovered well from the maintenance and we had good germination of the seed that was cultivated through the Graden. The focus now is try and harden the plant with the use of phosphites, iron, calcium, magnesium and potassium through the months of slow growth minimise stress and damage. This time of year disease is common climatic conditions often being mild and damp which is favourable, specifically for Fusarium. We will use fungicide where necessary to keep the greens as clean as possible. The industry has declared another two fungicide chemicals which are being reviewed next year narrow the greenkeeper’s armoury even further. The bulk of the winter work this year will be on the tees. We have begun the process of renovating the ones we are doing in house by stripping the surface and removing the turf. We have a cultivator arriving next week to work the surface so we can re-level and finish with some fresh rootzone. They will then be turfed. By next spring they will be ready for the season ahead. The contractors are starting towards the end November and if all goes smoothly will be around for roughly two weeks to complete their work. We hope to minimise disruption to golf however there will be some temporary tees and extra traffic around the course for this period. We have also started installing some extra irrigation to the tees where needed to give them a better chance of staying healthy in the summer months. The aftercare of the tees will mean a good aeration and feeding program and the right amount of water. The bank on the left side of the 5th green will also get some attention from the contractor. We will be doing our usual winter tree maintenance across the course along with some other small tidying jobs to improve the aesthetics of the course. In team news one of our green keepers has just had a baby boy born on Monday evening. Congratulations to Danny and his wife. Tom our seasonal greenkeeper is leaving us later this month to go to France for the winter so we also wish him well. That’s all for this month. We hope the weather stays dry enough for good golfing conditions to continue and you all get the most out of the course. As summer comes to a close and the frosts begin as we move forward into autumn. The direction of the daily tasks shifts from cutting to maintaining with the grass growth slowing down. There has been much to focus on this month with greens maintenance taking place, contractors for vertidraining, hedgecutting and step building. 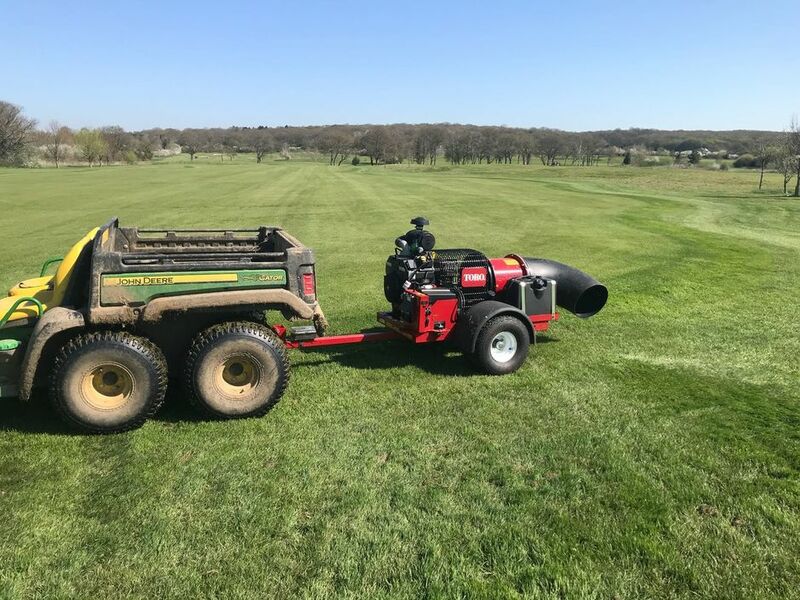 Earlier in the month we had some new equipment on demo for the Wellesly pro-am consisting of a Barroness greens mower and a Toro fairways mower, both of which were an absolute dream. Both of these will be something to consider when the time comes to renew our current machines. The annual machinery maintenance operations have also began with a couple of machines already receiving some well needed treatment after a busy year, upkeep of the machines is one of the most important tasks that needs to be undertaken. If we have faulty machines they will not perform at an optimal level. This months projects consisted mainly of resurfacing the bridges with sheet metal for extra strength and longevity, this should hopefully mean they will not need attention for a few years. We have also completely replaced the footbridge on the 10th which had got quite bad over the recent months. The 15th piling has now had the Acro props installed with sandbags along the edge and is ready for backfilling. This should reduce erosion and keep the 15th green where it is now. You will have probably noticed the hedges have been cut back which has opened up some areas and tidied up the look of the course all over. Some steps have also been erected on the 13th which look fantastic and will hopefully be a little less slippy in the winter. As you are probably aware, we carried out our greens maintenance session last week with the Graden. This is a deep scarifier with a connected sand hopper that backfills the scarification slits with sand and seed as you go. This has to be filled manually as the machine is moving which is hard work for those involved and quite labour intensive. This actually covers more surface area than hollow coring which we have done previously. We went down to a depth of 30mm, using 45 tonnes of kiln dried sand and 80kgs of Bent grass seed. This will start to germinate in the next few days and will establish itself ready for winter. The sand in the profile will provide a firm and free-draining putting surface all year round and will reduce excess thatch. We will continue to extract thatch until we have the desired level of 6%. Well done to the team for their hard work last week, there were some long days and some sore hands at the end of it! We will be fertilising the greens with an autumn feed containing potassium, calcium and magnesium which will help toughen the plant and aid photosynthesis during the cooler period. Whilst we carried out greens maintenance contractors were enlisted to vertidrain the fairways to make the most out of the course closure, this will hopefully help the water drain away and stop the water logging situation in the months to come. They managed to get all the fairways done and also some of the problem carrys and approaches, which I believe is money well spent. We are also looking into updating the drainage on the 11th fairway but are still finalising the numbers and acquiring an appropriate date. August has seen the prolonged drought come to an end with some much needed rainfall over the last few weeks. The course has recovered well however nearly every area of the course was affected in some way, leaving us some work to do to bring the course back up to standard. The tees have been the hardest hit area, leaving many with little grass coverage. The thatch levels are extremely high on the surface of the tees making it difficult for water to penetrate the rootzone. When dry, this creates a ‘biscuit’ like layer on top making it inhospitable to the grass plant. We still aim to renovate as many tees as possible with the resource we have available. There have been some areas around the greens which have been left bare so we have hollow cored, seeded and dressed these areas to try and get some grass coverage back. The greens have been under an incredible amount of stress in the last few months and trying to find the balance between irrigating, aeration and fertilising has been challenging to say the least. The fine line between not enough or too much water is practically impossible to gauge without expensive equipment so we do our best to keep the greens from drying out but without over-watering which can be just as damaging. As we come to the end of the summer, some of the areas which have been heavily watered are now suffering from anthracnose, a turf disease which is common this time of year caused by high traffic volume(golfers), excessive watering and insufficient nutrients. We have applied a fungicide to rectify this and tried to keep the grass well nourished to help regeneration. The weed Pearlwort has been successfully eradicated from the weedkiller application earlier in the summer. We have also been plugging some localised areas on the greens which had an infestation of toadrush which was spot treated. These have come back very well. Later this month we have our greens renovations. We will be using a Graden sand injection machine to rip out organic matter in the top 30mm and inject kiln dried sand along with Bent grass seed. This is slightly different to hollow coring but has the same outcome overall. We also have contractors coming in that week to Vertidrain the fairways whilst respective holes are closed to the members. Over time this will help drainage and relieve compaction. We have been lucky enough to obtain some insecticide for leatherjacket grubs and chaffer grubs which was imported from America on an emergency license. We had some significant leatherjacket damage earlier in the year. There were only 800 litres available in this country: 460 of which went immediately to airports and horse racing venues and the rest was left available for golf courses. We were fortunate enough to be offered some which will eradicate the chance of infestation next year and keep the greens free from damage. The ditch clearing has been completed with the 1st, 2nd/14th, 4th/5th and 8th cleared. This has had a positive impact on the visual aspect of the course as well as the drainage capabilities. We also created a small ditch at the top of the 11th to catch excess water coming from the railway and onto the hole. We hired a Root pruner for a few areas on the course which were being affected by large trees nearby. The 8th green on the right hand side has been a dry area due to the large Oaks sucking the water from the ground. The turf cannot compete with that so we used the root pruner to sever the roots under the green. The piling behind the 15th green has gone up successfully with the help of the hired excavator. We still need to sandbag, reinforce and backfill to complete the task. That’s it for this month, make the most of the warm weather and hopefully see you on the course. The drought finally gave in with a big dumping of rain amounting to 40mm over the weekend. This has been the first test of the newly lined 11th bunkers which I can happily say has been a success. The prolonged dry spell has been the longest I can remember in my lifetime amounting to two month almost to the day bringing its own set of challenges, but also giving us a reprieve from the battle of grass cutting so frequently in order to stay on top of things. This has allowed is to carry on with a few project bits to help improve the course. Ditch clearing has begun on between the 2nd and 14th holes having been left for some time to accumulate. The impact has been instant with water flowing freely and the area looking tidier already. We plan to do the along the 1st, 4th carry ditch, 8th ditch and have a good clear out between 4 and 5. The 16th tee erosion work is now almost complete having installed the piling, backfilled and fitted the drain. It still needs some finishing touches but this should ensure the water is carried straight into the stream. There has also been a drain installed on the path by the 15th green. This is similar to the one installed by the contractors on the 9th using the same materials. This will stop run off from the path hopefully stopping mess in the wetter months. We plan to install some more of these over the next few months. The greens have been through the mill this month with such extreme temperatures putting stress on the plant. The irrigation has been on everyday for two months accompanied with localised hand watering to ensure the turf stays moist and relieve dry patch. We have been feeding at more regular intervals as the plant’s stomata close in extreme temperatures, making it harder for the treatments we apply to be absorbed. The weedkiller that was applied roughly two weeks ago has hit the weed pearlwort well, however there will be some brown patches appearing on the greens in the next few weeks . This is nothing to be alarmed about...it is actually a positive step! We are verticutting Thursday this week to remove the dead material and dressing after. We can then fertilise to assist the recovery of the grass plant. Overseeding will take place when we do the Graden work at the end of September. Well done to those who competed in all sections of the club championships and congratulations to those who came out victorious. The feedback from the course has been great with such dry conditions so thank you for your positive comments. In team news, Matt our in house mechanic has moved on to new pastures, we wish him all the best. Meanwhile, Dan is now nearly complete on his level 3 qualification with just a few finishing bits to do. Danny has recently passed his boom-spraying pesticide application test enabling him to use our powered sprayer on the course. Rob also has some excavator training booked in so should be qualified by the end of the month. In the coming weeks we have some more path drains to put in, the piling on 15 to install, some bridge repairs to complete. That’s all for this month, enjoy your golf and hope to see you on the course. June has seen the course packed out with golf every day this month. There has been plenty of work going on around the course with main point of the last month being the completion of the bunker work on the 11th fairway and 1st greenside. With high temperatures edging nearly into the 30’s and practically no rainfall, the course has dried up giving a few extra yards of run on the fairways and working the irrigation system daily. Many grasses go dormant at these temperatures, with growth slowing right down. The greens are holding up well although temperatures above 25 degrees can cause the turf plant to stress. We try to combat this by applying a cocktail of treatments such as seaweed, amino acids, phosphites and PGR’s (plant growth regulator) along with standard liquid fertiliser containing nitrogen and potassium. We also apply wetting agent to help water penetrate the surfaces which become hydrophobic as dry patch causes a waxy coating on the roots of the plant, making it unable to absorb water. The guys from Whitemoss Eco came down from Leicester to help install the bunker lining last Tuesday. The actual installation was quick process with all 3 bunkers being lined within 5 hours. The joins then had to be glued with a special adhesive on the following morning and left to set for 12 hours. The faces then need a light scattering of sand, which will work its way into the lining when dry. This should help stop wash-down when heavy rain hits. After leaving for another day the bunkers were filled with sand and consolidated, then brought back into play. The 1st greenside bunker is also now back in play. The drain causing the flooding has been diverted to the land drain running parallel to the driving range, stopping the flooding in the bunker. This was not as straight forward as we had hoped but we got there in the end! With club championships just round the corner, we are tidying the course and preparing the greens for the next few weeks. We have applied a light dressing this week to help true up the surface. This actually has a blunting effect on our mower blades so once the sand has bedded in, the greens mower blades will be sharpened and the height of cut lowered slightly. Good luck to all those entering in all categories. We have finally sprayed all the surfaces for weeds including tees, aprons and fairways with some areas of rough. Clover, Daisies and Dandelions were the main offenders with such a wet winter, but should now be in decline. At the end of July we have booked a long reach excavator to assist with some ditch clearing. We plan to reach some areas that have not been cleared for some time to improve the flow of water through the course and improve aesthetics. As some of are probably aware, many of the footbridges on the course are in need of some attention. We are going to trial some sheet metal instead of marine plywood as this only lasts around 18 months with the current materials. We hope this new method will be longer lasting and also stronger. Watch this space.....! That covers everything for this month, enjoy the sunshine and see you on the course! The work on the course is progressing well as we move further into summer, with the 1st greenside bunker being dug out to reveal a clay pipe that seems to have an endless flow of water. We are hoping to resolve this issue this week by installing a new drain with inspection chamber to divert flow out of the bunker and into the drain that runs alongside the driving range. The bunkers on 11th are prepped once again ready for the new liners to go in, this will be taking place on the 19th so hopefully they will be back in play soon after. There have been some more areas of erosion that need attention, the path to the 16th tees is under attack this time, we have some piling to go in to stop the issue and once backfilled the path should be back to full width. The 15th green area has had large amounts of rubble put in and this seems to be stopping the swirl that is causing the erosion. With the grass growth accelerating it has been a struggle to keep on top of it whilst keeping the mess to a minimum, the short weeks due to bank holidays not helping matters. The greens have had their continuing maintenance treatments, with another application of iron going down last week and aeration this week. I think you will agree that they are in superb condition and are putting exceptionally. The team has now expanded for the summer, with the addition of two seasonals to help us maintain the course whilst we continue with the ongoing project work, always trying to improve the course where we can. Pat and Rob have both finished their respective college courses and are waiting for their certification, Danny is ploughing through his course in good time, whilst I am finalising my portfolio to be handed in next month. There have been a few modifications to areas around the course, not only for aesthetical reasons but also to improve playability, the fairways on 6, 9, 12, 17 and 18 have all been widened to increase fairway area. A new fairway has been added on 15th which will have contrasting lines to the apron. The aprons have also been widened on 6, 12, 14 and 16 to add to the looks and try and bring some of the greenside bunkers more into play. The surrounds mower areas seem to have doubled in size, with extra lines being added all over, which I feel greatly improves the views of the course (and obviously the shorter grass is nicer to play out of). It has been a relatively nice month seeing some pretty good temperatures, apart from a few day of torrential rain which saw this month’s rainfall shoot up to 82mm which turns out to be the wettest may in a few years. Thank you for your time,Hope you enjoy the course. With the season now in full swing it is great to see the course packed out with golfers after a pretty miserable start to the year. The weather last week was exceptional, reaching up to 25 degrees which helped dry the course out massively enabling us to get all areas cut and back under control. We have kept the semi-rough mower working non-stop to combat the cut grass clipping and have also employed the use of a powered blower that some of you may have seen (or heard) around the course. This machine was also used to clear away the debris pulled out of the profile by the Graden Swingwing, a scarifier that we have been give to trial on our fairways and tees. We managed to do the 11th fairway and a handful of tees before encountering some technical issues but this should be back up and running once again. We will be fertilising the tees this week to aid recovery. The greens have recovered well from the maintenance that we carried out earlier this month which included scarifying, aerating, over-seeding then dressing. Yet again the weather was against us with some heavy rainfall prior to the work being carried out, however we endured with our plan and achieved our objectives none the less. The greens have been fed with 4-3-4 fertiliser with added calcium and magnesium, along with a treatment of amino acids, phosphites and Primo maxx to keep the plant healthy and aid recovery. The bunkers have had some attention and are mainly back in play, all aside from the 1st greenside and fairway bunkers on the 11th. This is at the top of our projects list and will hopefully make a start on those next week. With projects in mind, we have two seasonal staff starting with us next week to help us keep on top of the summer workload. They are both keen golfers so should hopefully take to the job quickly! Other projects include finishing the 17th erosion, the 15therosion, some pathway improvements and ditch clearing. The irrigation is up and running and we now have a contractor employed to help us bring the system up to scratch and ensure there are less faults going forward. The irrigation system is very expensive component which is often unseen by golfers and is sometimes overlooked , however the greens, tees and approaches would struggle to survive without it. That’s all for this month, have a good month and see you on the course. March is the beginning of the golfing season. With competitions starting and some friendly matches on the fixture sheet we are all eager to get our game in shape for the summer ahead. With 110mm of rainfall during march, this has given us one of the wettest starts to the season I can remember. Whilst the course has held up well, the weather has taken its toll. 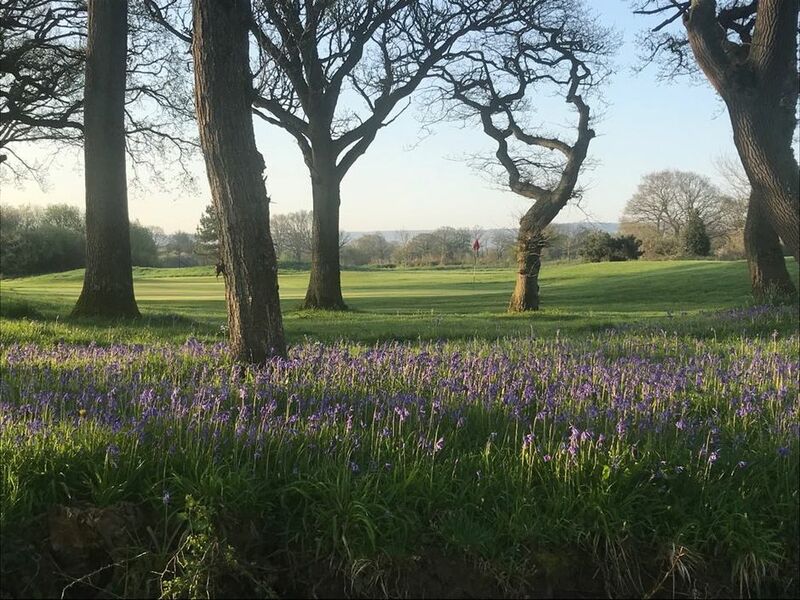 In order to keep the course open, we have had to manage the traffic to the best of our ability to ensure minimum damage is caused to the course. We have done our best to keep the course open and playable as much as possible, i hope you’ll agree. The 9th drainage works is now complete. The contractors have installed the working drains, which has eliminated the flow of water from the road onto the apron. The drain that the green keepers have installed on the apron has also prevented some puddling in the low spots. We are now just waiting for the turf roots to take and then the area will be fully open for play once again. We apologise for the disruption and thank you for your patience. The greens have come out of winter in fantastic condition and we have been inundated with good feedback in the last month. The regular aeration program along with the treatments of iron, phosphites and a light feed have given the turf every chance to be healthy and disease free. We have added some humic and fulvic acid into the soil profile which is a bio-stumulant, increasing the rootzone’s ability to hold nutrients. As our greens are sand based, they hold little nutrients and require intense management to ensure the plant has enough nutrition to stay healthy. Our maintenance session is this week, and having such wet weather we have had to adjust our processes slightly. Our plan is to use the scarifying units we have borrowed to remove thatch in the top 10mm of the surface, then verticutting to remove lateral growth. Solid tining after that, followed by overseeding with bent seed, with a light sand dressing to finish. This will be done over 2 days. This process will mean less disruption to the surface than our original plan, which involved filling tine holes with sand. Recovery will be swift and this maintenance will help provide a firm and true putting surface throughout the season. The Vertidrain has been working away in the last month on the tees and some areas on the fairways to help water movement. The greens were also done last week ahead of maintenance this week to promote root growth as soil temperatures are slowly beginning to rise. The plinths have been taken in, sanded down and varnished to give them a facelift. Over the course of the winter we have worked our way through all of the course furniture. I hope you all agree the difference is noticeable. Looking ahead we have a few items of machinery booked for demonstration. We have a fairway scarifier coming in to hit the fairways with. This will remove some organic matter from the surface and if done on a regular basis, should help reduce water retention. We also have some powered blowers coming in to help remove the excess left on the fairway. We are also hoping to get the tees done with this machine. That covers everything for this month, hope to see you on the course! February has been a productive month on the course having had a mixture of weather over the last 4 weeks. Some heavy spells of rain have caused some wet spots on the course, meaning some holes (the 9th and 11th in particular) have suffered more than most. As you may already be aware, the 9th is not a simple fix as the water is coming off the road, down our entrance and onto the 9th apron but be reassured we are in the process of rectifying the issue with drainage being installed by a contractor to catch as much water as possible before it gets on the course. This work will hopefully be fully installed by the end of March. The “Beast from the East” left the course with a good covering of snow last week meaning the course was shut for a while. Thankfully it did not hang around for too long as temperatures were sinking as low as -16 degrees Celsius! The team still kept busy even though the course was shut giving the tee plaques a much needed lick of paint (they look like new) and some more clearing work on the 12th, 14th and 16th. The greens are holding up well for the time of year with our aeration program continuing through twelve months of the year. We used the shallow slitter last week to create small slits into the thatch layer and help break surface tension and allow water to penetrate the surface. The incoming cold weather will help suppress any fungal disease on the greens with an added application if iron being added today to help strengthen the plant over the next few weeks. The tees also got an application of iron to give them some colour and strength. On the subject of disease, next month we lose another important chemical which was used to combat disease on turf. Iprodione will be coming off the market which narrows the fungicide group for turf down to 5 chemicals. Along with Carbnedazim (worm cast suppressant), Chlorpiryfos (leatherjacket control) and Imidacloprid (chaffer grub control) and some other fungicide chemicals also being reoved, the task of trying to control pests and diseases grows ever more challenging. On a more positive note, we have managed strip and level 2 more small tees on the course. The 2nd ladies and 14th ladies were particularly poor and also easily accessible from pathways making them easy for us to work on. They have now been completed and will be back in action hopefully for the start of the season. The clearing work on the 4th hole is now complete for this season. The left side of the hole has been thinned out and tidied along with the 5th hole to create a better aesthetics and more chance of finding a wayward ball off the tee. The plantation by the 14th green/15th tee has also been cleared again. This area may be used for a wild flower plantation later in the year. Our next clearing project will be on the left side of the 12th hole leading up to the bunker. It saddens me to say that we have a reoccurrence of a golfer or golfers taking divots out of the greens and collars on the course. Please be vigilant and report any such acts to a member of staff as this is being classed as vandalism and will not be tolerated. In team news, Matt has passed his probationary period and now officially a full time member of staff. Well done Matt! Rob and Pat are now complete on their NVQ’s with their completion date at the end of February. Once their work is handed in, it will be assessed and they will be signed off. Danny is also progressing nicely. He is also starting his pesticide application certificate next month which will enable him to handle and apply pesticides on the course. Dan is motoring along with his level 3 and my course is also going well, although challenging at times! Looking forward to spring we are thinking about fertiliser and course maintenance procedure with use of some new machinery to help improve the surfaces on the course. Thatch build up is problem on many areas of the course so with that in mind we will be starting a program combat this build up. With the project list growing all the time, we have plenty to do in the next few month and we are all eager to continue to impact the course positively. That’s all for this month, enjoy your golf and see you on the course. Paul Oliver, Golf Course Manager. Further to my February Course Blog, I thought I would give you an update on our Drainage Projects. As you know, winter drainage on the 9th fairway has been a problem for some time. It had been thought that flooding from the pond was a significant contributory factor. Last summer, we created a new ditch to carry excess water from the pond as well as clearing and enlarging the existing overflow drains. These have worked extremely well but the drainage problem has persisted. We now have clear evidence that the problem is being caused by flooding from Spatham Lane. Excess water from the entrance has been finding its way along the pathway alongside the 10th tee and down towards the 9th green and ending up on the approach. 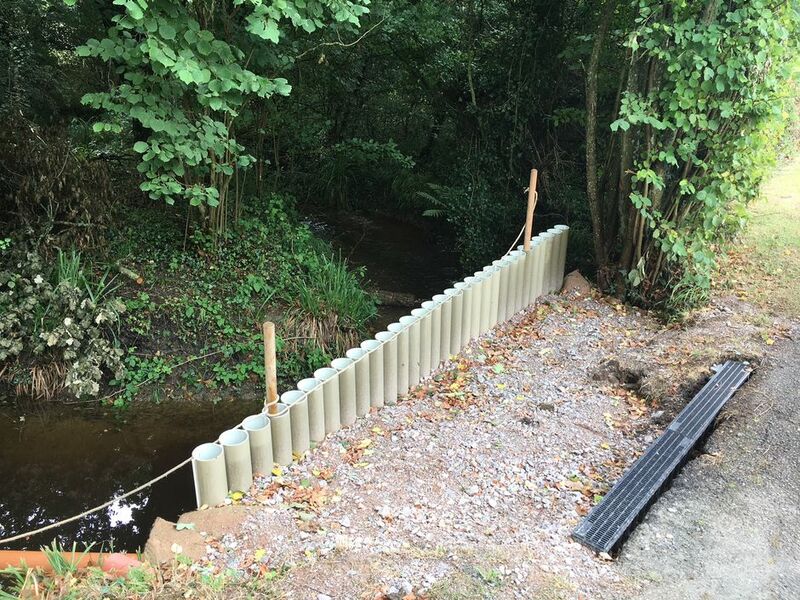 We have been in dialogue with East Sussex Highways Department for several months and it seems that we cannot rely on them (not in the immediate term at any rate) to do anything constructive to prevent the flow of the water on to our property. 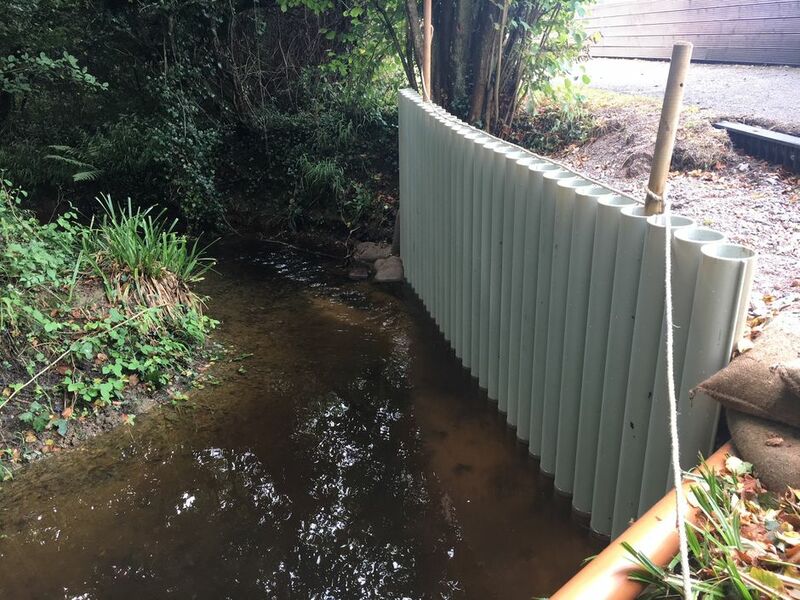 We have decided, therefore, to greatly enhance our ability to deal with the Spatham Lane "over flow", once the water has reached our property. Contractors will be starting tomorrow to install a drainage system starting at the gate by the 10the tee, with two gullies, one each side of the road situated at the low point of the entrance where the water gathers. This will then be taken along the path in a series of drains and into the pond on the 9th. The path leading from the 9th green will also be resurfaced. In an effort to stop the approach puddling, we have already installed two more drains on the fairway beside the pond to help keep the area dry and in play. We have also landscaped this area to direct the flow of any remaining surface water into a gully and then into the pond. 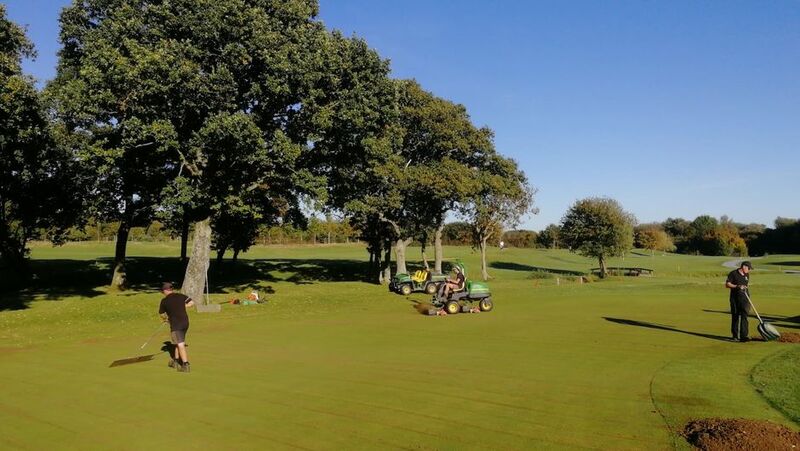 We are confident that the combination of these two projects will greatly improve the playability of this area and will contribute to keeping the course open more frequently during bouts of prolonged wet weather. We are also investigating the condition of the drainage on the 11th fairway. Historically, the upper reaches of this fairway have not been a particular problem but this winter the drainage in that area has been troublesome. As you know, we have already cleared and replaced the drainage within the fairway bunkers in readiness for the late Spring golfing season and we know that these are working well. However, our preliminary investigations suggest that the drains between the green and fairway bunkers are blocked and leaking. We have decided that rather than try to repair these, we will install a new series of drains, as well as run new ditches along both sides of the fairway. We are determined to get this problem solved once and for all! These works will be fairly time consuming and will require some heavy machinery to access the course. We can start these works once the ground has began to dry out, and you can be assured that we will do so as soon as practical. Notwithstanding the difficulties outlined above on the 9th and 11th fairways, the remainder of the course has performed remarkably well in difficult conditions. Even when torrential rain has caused localised flooding, the course has drained fairly quickly. Our aim is to get all our fairways up to the same high standards. 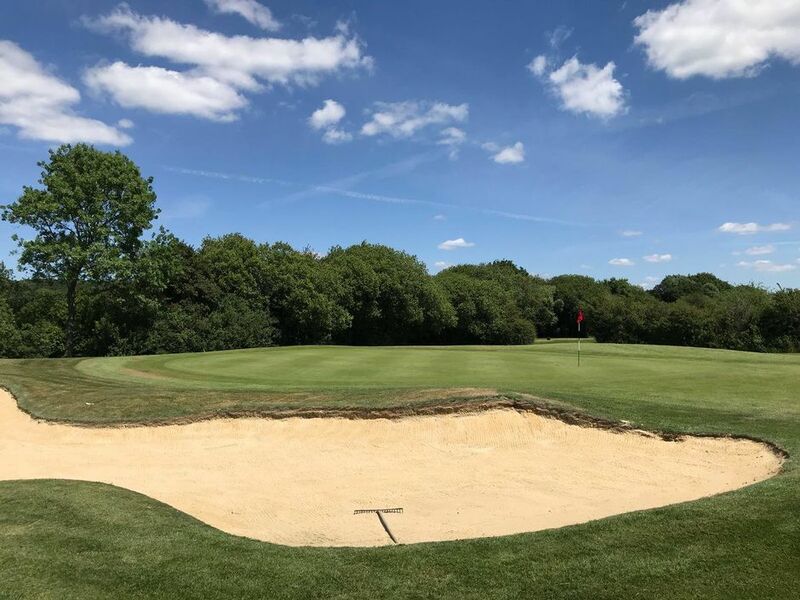 We have a long list of "special projects" - bunkers, erosion etc - for the coming months and we are determined to continue the improvements which you have seen in recent years. A little bit late but still I would like to welcome everyone in to the New Year. The depths of winter are in full swing as we go forward into February, not the kind of cold winter we hoped for with the amount of rainfall over Dec/Jan - hitting 221mm! Understandably then, the course has seen some closures over the past couple of weeks. Some parts of the course have been hit harder than others resulting in hole closures 8-12. We are doing everything we can to try and bring these back into play although with the trying ground conditions it is proving difficult to get any machinery out there to rectify the problems. The tree work around the course is progressing, which is definitely tidying up the areas and improving aesthetics of certain holes. The trees between 2 and 14 are the latest targets and the area is nearing completion. When they begin to grow in spring I believe that the improvements will be very noticeable when compared to last year. To improve the drainage on the greens and tees the verti-drainer has been out again, I am sure you will have noticed the difference on the teeing and putting surfaces. The returfing of the 12th white tee and the wall in the 18th bunker are rooting nicely, the tee will probably be put back into play in the spring and the bunker within a few weeks, so no more free drops I’m afraid! Work on other bunkers around the course needing attention should be commencing soon as we are forecast some dry weather for the next week. Hopefully this should help the course dry enough for us to get out with the machines. Regarding pathways and roped areas please do not walk underneath the ropes, as with excessive traffic when the ground is this wet it does not take long for the areas to get a little swamp like. There are signs directing you on which way to go. The newest section of roped area is the 13th, if everybody could enter and exit the green from the front next to the bunkers that would be greatly appreciated. With the weather not being as cold as usual for the time of year we are, unfortunately, beginning to see disease showing on the greens. This is due to warmer, wetter weather than that which is normally associated with winter. Disease management is very important as if not kept on top of then it can quickly overrun the green. We have been performing regular checks to ensure the spread of disease is at a minimum, spraying iron or fungicide when necessary. We did manage to get the first cut of most of the fairways which were getting out of hand, they will hopefully now be cut when required on a more regular basis weather permitting. The greenkeeping team have also been doing a little moonlighting as decorators the past few weeks, paining the doors in the clubhouse. With one final door remaining to finish off the end product should look good. The festive season has been a good month on the course, tackling some areas that have been left unmanaged for long periods of time. 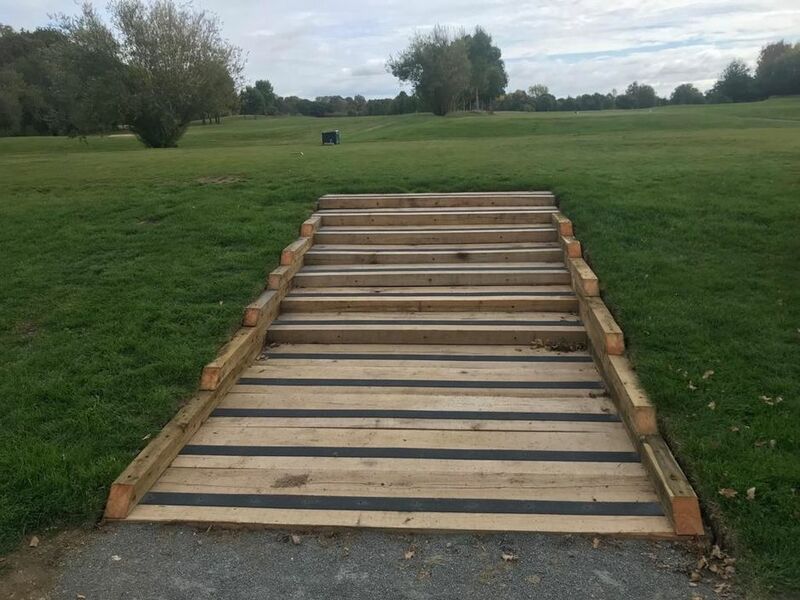 Due to high levels of rain and frosty mornings we’ve had over the last month, accessibility around the course has been tricky to say the least! This however does not mean there is nothing to do! The chainsaw and strimmers have been working away relentlessly to clear some untidy areas of the golf course. The area between the 7th and 12th has had a facelift, clearing away some self-seeding trees and thinning out the scrub which enhances the view across the course. 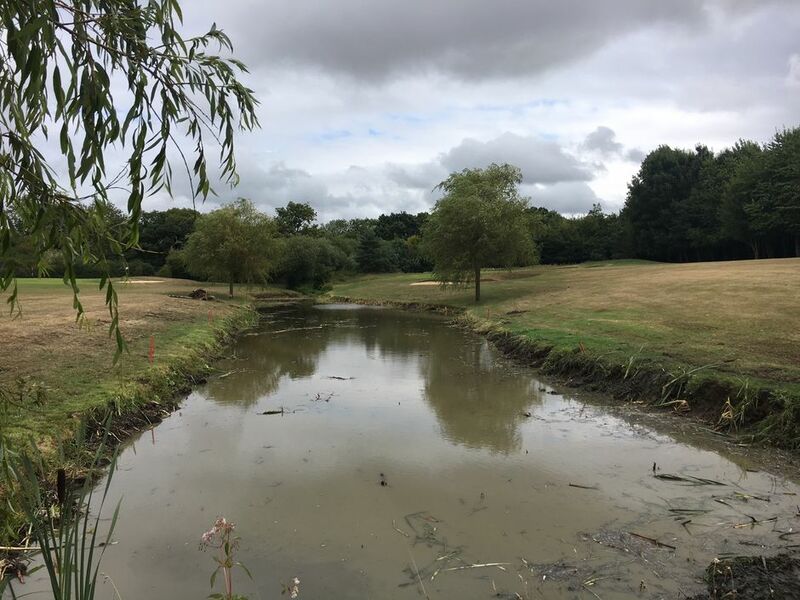 The area between 4th and 5th has also had a clear out, the small island in the stream now looks presentable and the view from the 4th tee should have clearer view for those who strike it left of the tee. 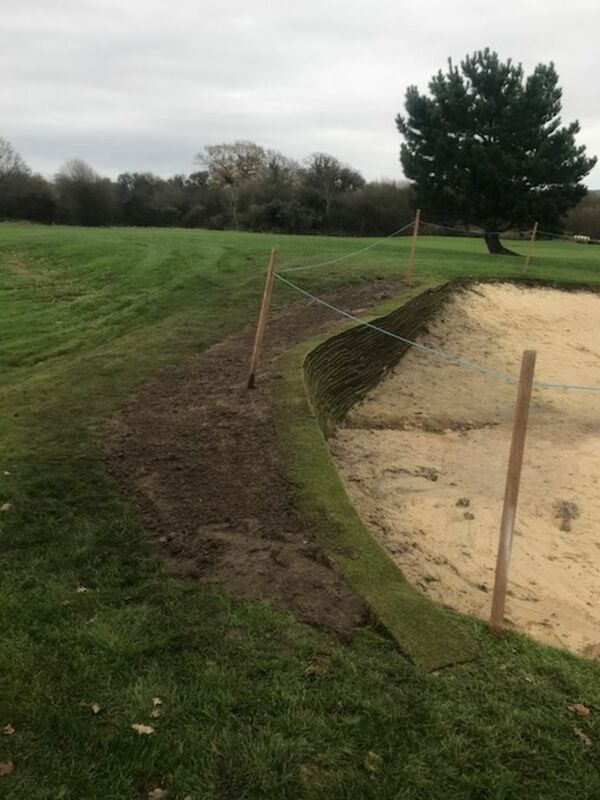 The turf for the 18th bunker and the 12th tee was slightly delayed to heavy snowfall at the turf suppliers but thankfully it cleared quickly and enabled us to get the turf down before Christmas. We look forward to getting the tee back in play before the season starts and the bunker should be back in play soon. We would have liked to have stripped a few more tees before Christmas, however the wet weather has made it impossible to access dump sites and manoeuvre waste around the course without causing damage. We will endeavour to do as many as we can when the weather allows us to. We have put a plan together to help combat some of the flooding on the 9th approach. As the water feeds down from the road, down our entrance and flows down the path alongside the 10th tee, this causes constant flooding and is essentially destroying that part of the course. We intend to install channel drains along the 10th pathway and revamp the small path leading from the 9th green. This will catch all the rainwater and feed it into the pond before it reaches the 9th apron and fairway. In team news Rob and Pat have nearly completed their Level 2 qualifications with only a matter of weeks to go. Dan has completed and passed his chainsaw maintenance and cross cutting course so can now use a chainsaw on the course. Dan, Matt and I have also recently completed grinder training. This will allow us to sharpen all blades on our cutting units throughout the year, ensuring the quality of cut is clean and sharp all year round. Cutting with blunt blades can affect the health of turf, as a cleanly cut blade heals quickly compared to torn blade, which puts the plant under stress and making it susceptible to disease, particularly this time of year. We are now putting together some thoughts towards what we intend to achieve in 2018. 2017 was a tough year with lots of changes, not just in the greens department, but across the entire business. So with a more stable team in place and in all other departments, we hope to have a progressive year with the focus on enhancing the course for your pleasure. The feedback from all the members, guests and even visitors from other clubs has been fantastic over the last 12 months, particularly during the last few months going into winter with reports of other courses suffering with the wet weather. That’s it for this month and also 2018. From me and everyone in the Greenkeeping Department, we hope you had a great Christmas and have a prosperous New Year. The course is holding up well considering the level of rainfall in the last month. Needless to say there are still some areas that are becoming extremely soft and we are doing our best to manage this as best we can, and with your cooperation it will minimise the damage to the course. The greens are in particularly good shape heading into winter with the fungicide program doing its job and the regular aeration work keeping moisture from the surface. We aim to get the slitter out once a week where possible, making use of the weather windows that are presented to us as this time of year it tends to be either wet or frozen! The grass has finally slowed down giving us the opportunity to carry out some project work throughout the winter. This weekend is the Greenkeeper’s revenge. We have been scheming away to try and challenge both your patience and ability! We hope you enjoy the weekend, we look forward to hearing how people got on! 2 of the fairway bunkers on the 11th have been out of play for a while due to the clay base becoming extremely soft, deeming them unplayable. We plan to use some chalk we have obtained to raise the base of the bunkers, making them shallower and also firmer under foot to give a stable base. Whilst we would like to get this job done immediately, the soft ground conditions are not ideal for carting heavy loads of material across the course, so this will be done as soon as we can, without causing damage. The 18th fairway bunker is almost complete, with the back edge just waiting for turf. We have already had great feedback from some of the members about the turf wall, it gives a slightly different aspect than the other bunkers on the course and certainly a challenge for those who end up in it! The 12th white tee has been stripped and levelled. This was a particularly poor tee with minimal grass coverage and an unhealthy profile. We plan to get as many of the poorest tees done over the next few months’ weather permitting, as there are many that need attention. Winter is the time for tree work which will continue from last year. 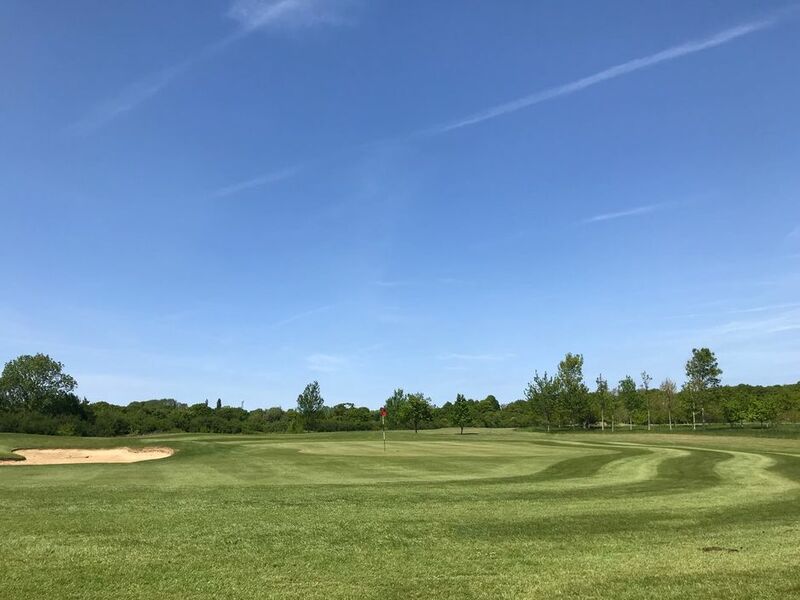 The clearing and strimming work will take place across the course, along with chainsaw work to tidy tree plantations, removing unwanted growth and allowing the desirable trees to flourish as well as making these areas look tidier. The 6th carry has been our first place, raising the crown of the healthier trees and knocking back the brambles. We are also going to clear the area between 7 and 12. The drain on the 6th is complete with the turf being laid a couple of weeks ago. In team news, we have our new mechanic in the greenkeeping department. Matt has already displayed his skills with servicing and minor fixes and will be a good addition to the team. Everyone is progressing well with their training courses and a few of us will have some extra in house training in the next few months. Lastly, I would like to take this opportunity to thank my team for their efforts through the year. There have been a lot of early starts, long days and late finishes which do not go unnoticed, so thanks for all your hard work throughout the year. That’s it for this month and essentially this year as 2017 comes to an end. From everyone here in the Greens department, we wish you a great Christmas and a happy new year. Autumn is well and truly here and as the clocks change we are heading into November with the course in good condition. Disease has struck on the greens recently with September’s rainfall being so high and mild damp conditions creating perfect conditions for disease to spread. Applications of fungicide have prevented any lasting damage so as the growth slows down we are in great shape going into winter with very little scarring on the greens. The preventative fungicide program will continue until December/January. Applications of iron, potassium, phosphites and calcium will help increase the plan health minimising the risk of outbreak and we have also raised the height of cut on the greens to 4.5mm which will help reduce plant stress. The Vertidraining we’ve recently carried out will help get the moisture away from the surface which also encourages disease, moss and surface water build up. I would just like to say a quick thank you to Barry Stacey for his help over the last week. We try to cause as little disturbance to play as possible when carrying out such operations but on the occasions that we are amongst the golf Barry has helped our department by liaising with both visitors and members to help minimise disturbance for both parties. It helps massively so thanks Barry! As well as dragging a chain, we have purchased some fairway roller brushes to help combat the mess left by the fairway mower. It is worth mentioning at this point that worm casts are also a contributing factor towards the clumping. As the soil becomes wetter, the worms become more active making more casts which smear on the surface and the only chemical on the amenity market has now been withdrawn from sale due to environmental reasons which has left green keepers with a significant problem. Our governing body, The British Institute of Golfing Greenkeepers have produced a poster explaining the problems this can cause which is up in the clubhouse outside the pro shop to inform golfers across the country of this issue. We will be trialling new alternatives next year to help combat the problem. The 6th carry drain is now nearly complete with the last pipe going in last week. With a few finishing touches it should be completed soon. That should ensure there is no flow across the 6th in times of heavy rainfall. The majority of the cable trench has also now been backfilled and seeded. Mats, post and rope will continue to be put out leading into the winter months to protect the course from traffic wear and tear. The prolonged rain in September has meant we are going into winter fairly wet so we respectfully ask that members adhere to the signs and rope placed around the course guiding golfers to minimise unnecessary mess. This will help keep the course in better condition through the winter. Leaves have also started to fall which is another thankless task, we do our best to keep the greens and tees free from debris by blowing them every morning before play. We have made a small adjustment to the stream behind the 15th green to redirect the flow away from the 15th greenside bank. This will hopefully slow the erosion until we get a chance to address it. In team news we have a new starter joining us whose main role will be to maintain our machinery fleet. We have a relatively small fleet of machinery however it is one of the biggest assets the greenkeeping department has so keeping it maintained and in working order is of great importance. We are also glad to have Rob back out with us on the course from his spell behind the bar. Looking ahead we are planning to finally finish the 18th fairway bunker this month and after that re address some of the bunkers which have been holding water again. The winter program is being put together to ensure we keep making improvements whatever the weather…. That’s all for this month, hope to see you on the course.